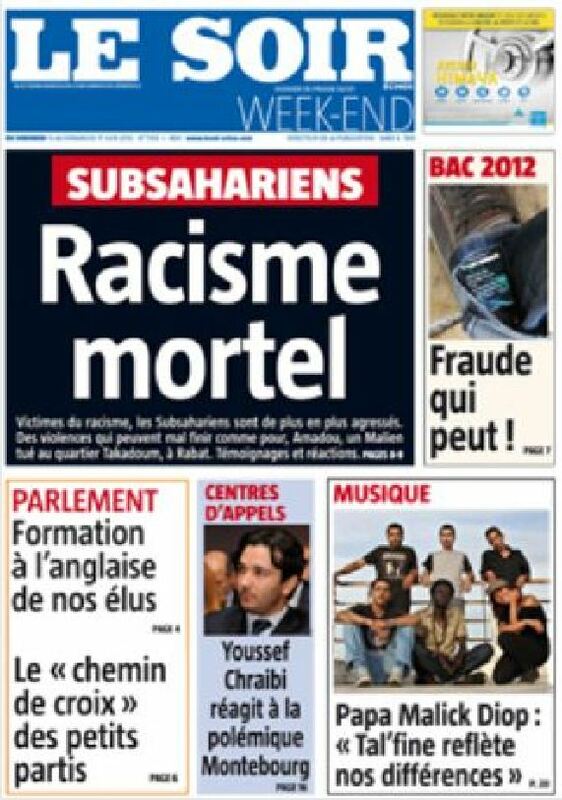 A feature article about the growing number of racist attacks on sub-Saharan Africans in Rabat and Casablanca, produced during a Media Diversity Institute training course, was published on the front page of Moroccan national paper ‘Le Soir’. The author, Salima Marzak, was one of seventeen Moroccan journalists that took part in a ‘Responsible Journalism’ training course, organised by the Media Diversity Institute, in Casablanca in May 2012. After two days in the classroom, the trainees pitched ideas for features they wanted to write about minority groups. Over the following two days, mentored by experienced trainers, they produced reportage on a range of issues including the experience of Malians who have to come to Morocco to escape from the war in their country and the experiences of divorced women in Morocco. One group also wrote about the only Jewish museum in the Arab world, which is found in Casablanca. The material the journalists produced was published by the newspapers they work for. For more information on the course click here. Marzak’s article identifies the extreme and often violent nature of racial prejudice in Morocco’s major cities, increasingly directed at sub-Saharan immigrants, who are routinely stabbed, beaten and sometimes killed. The article reports an incident involving a young sub-Saharan African man who was stabbed to death by a young Moroccan in Rabat after a minor altercation at the counter of a supermarket. Marzak concludes that this attack is reflective of a more general trend of increasing racism against sub-Saharans in Moroccan cities. Click here to read the article in French, or here to read the article in English. The success of Marzak’s article in reaching the front page of ‘Le Soir’ demonstrates the relevance and importance of the training that the journalists received on the ‘Responsible Journalism’ course. The course was organised within the framework of the Media Diversity Institute’s 2 year project ‘Media Evolution: Towards an Inclusive, Responsible & Independent Media in Morocco’, supported by the European Union Delegation, and UK & Swiss Embassies in Rabat. It was one of 7 training courses for journalists, among many other activities, including round table debates, training for NGOs and TV programmes, that will be organised during the life of the project. The objectives of the project are to encourage a public debate on the future of the Moroccan media, ensure greater coverage of social diversity in the media, improve freedom of expression and access to information, ensure greater responsibility by the media through self-regulation, and improve respect of media freedom by the government.